In the last week in June, there was a large demonstration by representatives of some 70 non-profit organizations, both religious and non, active in social assistance programs. They were protesting the absence of funds already allocated to the groups by the city and regional governments but which are still unavailable. 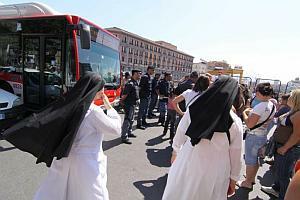 The demonstration produced the unusual scene of groups of nuns blocking traffic for a short period of time in front of the Naples city hall. The Coroglio road, which leads down from the Posillipo height to Bagnoli, is supposed to be reopened, at least to alternating one-way traffic, by the end of June. It was closed weeks ago after an umpteenth landslide. That on-again/off-again story goes back many years (the road was originally the work of Austrian engineers in the 1830s). 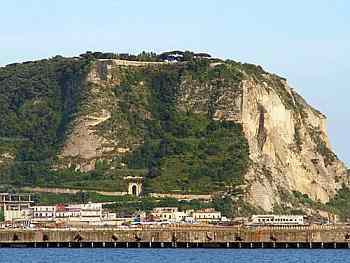 It is still the only convenient way to get from parts of Posillipo to Bagnoli. The Bagnoli end of the road starts at sea-level and then runs up past the entrance of the Seiano grotto (photo, right) and turns through a number of switchbacks before reaching the top of the cliff (out of view to the left in the photo). As of July 1, there will be 30 street construction sites open in Naples, many of them open even all night to get at least some of the work done during the summer. Of the 30, eight are long-term sites for the new metro stations, none of which will be open until 2011 at the earliest. The other 22 sites involve very necessary street repair and repaving. The work will coincide with the summer holidays of the traffic cops; half will take July off and half will go in August. This should be fun. Your own permanent box-seats (the Home Edition)! After the recent renovations at the San Carlo opera house, a number of box-seats are now for sale by the theater. Yes, for the low, low price of 400 euros you can set one of those plush red seats up in your own home and crank up the stereo! And MORE! Twenty dressing-rooms seats are also available for 1000 euros apiece; they each bear a plaque with information such as "dressing room tenor" or "dressing room conductor." You can sit where he or she sat, depending on who your particular he or she happens to be. Pavarotti's seat will thank you. Antonio Bertani, the owner of the newsstand located in Piazza del Gesù, has received an award from the president of Italy. Don Antonio is now a Cavalliere [knight] della Reppublica," an award for services rendered. His service is that he is an unfailingly optimistic and industrious representative of Naples as well as the promoter and mover behind various social initiatives to take care of "his" piazza, one of the most popular ones in the city and site of such iconic tourist attractions as the Church of Santa Chiara. For the last 40 if his 61 years, Bertani has been helpful and friendly to all passers-by. 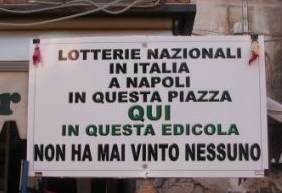 His sense of humor is legendary, as the sign (photo) posted on his newsstand shows: it tells you that you can buy tickets for the Italian national lottery here. In a nation where proprietors proudly tell you that such-and-such a winning ticket "sold here!" brought such-and-such ungodly amount of money to the lucky ticket-holder, Antonio says simply: "At this newsstand in this square in Naples, no one has ever won anything." Scugnizzi a vela [somewhat poetically, "Ragamuffins Before the Mast" or, if you like, "Street kids go sailing"] is a program sponsored by the non-profit social assistance organization, the "Life Association". Once again, they are sponsoring a summer program to teach underprivileged teenagers the craft of restoring sail boats and then of actually sailing them around the bay of Naples. It is done in collaboration with various child welfare groups as well as a staff of trained sailors and social workers. The concept goes by the name of Velaterapia—sailing therapy. Tourists who go to places such as Pompeii and Capri may not be aware of the intense competition among the tour guides who lead them around. The other day at Pompeii, two guides were haggling over who was infringing on whose turf. It got heated and, at a certain point, in full view of a crowd of tourists, one of the two just keeled over and died. He was 84. Matteo Salvini, a deputy in the pseudo-secessionist Northern League, has resigned over the uproar caused by his being caught on video (then spread on You Tube) of him at a bar joining in a rousing anti-Neapolitan "soccer chant." That's what some fans do; they sit up in the stands and rant, in this case: "Here come the Neapolitans... hold your noses... they never wash... even the dogs can't stand the stink." He later apologized and said it was nothing personal because right after that one, he and his cohorts sang a few verses against people from Verona. (Ah, good clean fun! Salvini is also the one who advocated separate metro cars for Milanese so they would not have to sit among all those unwashed foreign workers in Milan.) He claims he is resigning in order to serve in the European parliament and not over the episode caught on video. Northern League leader, Bossi, true to form, said Salvini should be censured not for what he sang but only because he has a terrible voice. Even more than the recent UFO sightings over Pozzuoli (!) and even more than the fact that people are staying away from local beaches in droves because of pollution, the item causing a real stink is local musicology and all-around culture guru Roberto De Simone's (photo) outcry the other day that culture in Naples is going to hell. "I hate this city. When I die, I am going to be buried somewhere else. A Naples without culture is fine only for those who have no culture to begin with." Harsh words, indeed, from one who has dedicated his life to the culture of his city. This may or may not satisfy De Simone (above), but there was a spectacular open-air concert in Piazza Plebiscito, the largest such venue in the city, on Friday, July 17. The combined orchestras and choirs of the San Carlo Theater and the National Academy of Santa Cecilia (in Rome)—400 musicians! (including a 40-member children's choir)—came together for a Verdi Gala under the direction of Antonio Pappano (currently the music director both Santa Cecilia Academy and the Royal Opera House in London). The orchestra and choir set up behind the two large statues in the square, backs to the entrance and colonnades of the church of San Francesco di Paola; they faced the Royal Palace and an audience of about 9000. The program included a number of Verdi overtures and excerpts (Nabucco, Luisa Miller, il Trovatore, Aida, Otello) and one item not by Verdi, the glorious prologue from Mefistofele by Arrigo Boito, featuring the children's choir and the young Ukrainian bass, Alexander Tsymbalyuk. Mefistofele is the only opera by Boito that you ever hear. I don't know if it is the only thing he wrote, but even if it is, his life was well spent. The Arabic word suk, meaning "market place" crops up more and more in Neapolitan newspapers these days, most recently in regards to Piazza Garibaldi, the site of the main train station as well as almost endless construction activity for the new underground train lines. The western side of the square has turned into a teeming hive of wandering vendors and portable stalls and booths. Almost all of the activity is illegal; not only is it unlicensed, but those involved are probably not even in the country legally. The city council has decided to "clean up" the area. No one I know believes this can be done, other than in a stop-gap sort of way: chase them away to another street for a while. Readers may know that an organization at new7wonders.com is sponsoring a world-wide election by email to select the Seven Natural Wonders of the World. Through the first few rounds of elections, the field has narrowed to 28, including the Black Forest, the Cliffs of Moher in Ireland, the Dead Sea, the Galapago Islands, the Grand Canyon, and the only entry entirely in Italy, our very own Mt. Vesuvius! I know how Neapolitans celebrate victories. I am hoping that Neapolitan volcanoes don't do the same thing. There are a few more run-offs before the seven winners are selected.